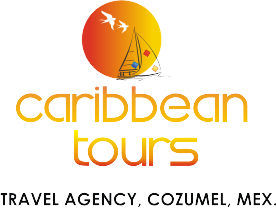 Caribbean Tours Cozumel is a Mexican company established since 2002, renowned in the tourist industry all over the zone. As a full-service destination management company, we offer assistance in solving any client concern and provide 100% confirmation of hotels, flights/connecting flights, immediate traveller and wholesale client response, as well as daily land tour operation to all major sites in the area. For groups our objective is to allow every organization the best professional service with the aim of satisfying their specific needs, giving out personalized attention in an individual or collective form. All Caribbean Tours staff is trained and ready to respond to you and your client’s concerns. Our company is always looking for the best value for your money. We work for you to make you feel this program is the easiest you will ever have. If you are planning to expand your business or travel to the Mexican Caribbean, please know that Caribbean Tours Cozumel is a company that will give you an advantage over your competition and earn your confidence with consistent quality service at the most competitive rates. Be sure we always offer you the newest in Cozumel. Your best way to the paradise.